This Irish child's dinner set is enhanced with shamrocks along with the tis herself motif. 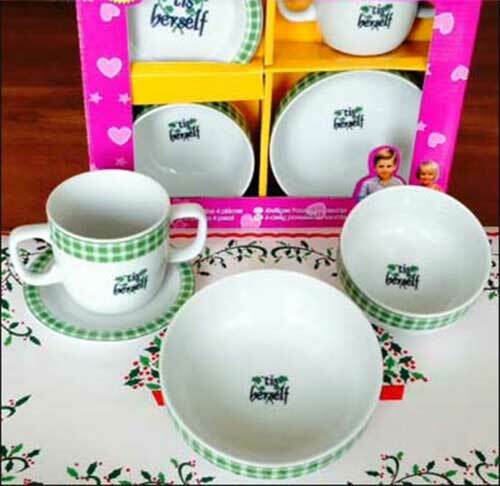 This Irish baby keepsake is a 4 piece child's dinner set that features the 'tis herself and shamrock motif; the set includes a 5" wide and 4" wide bowl along with a 4 1/4" wide saucer and a 2 1/2" tall cup. The child's shamrock dinner set is made of porcelain; the pieces are both dishwasher safe and microwave oven safe. 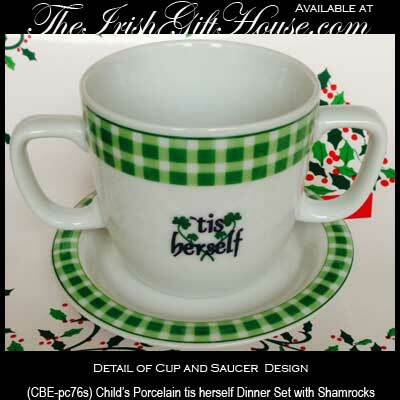 The Irish baby diner set is gift boxed with a shamrock history card, complements of The Irish Gift House.